The Cosmic Egg Timer offers an immediate approach to using the astrological birth chart to understand yourself and others. What kind of person are you? What makes you tick? What’s happening in your life right now? Which areas of life offer you the greatest potential? Astrological Psychology was developed after extensive research by Swiss astrologer/psychologists Bruno and Louise Huber. Combining the best of traditional astrology with modern growth psychology, it provides a powerful tool for self-understanding and psychological and spiritual growth. First published in 2004, then 2011, and now in this third, revised edition with colour illustrations, The Cosmic Egg Timer provides the best introduction to the Huber Method. It is suitable for beginners, as well as for professional astrologers, psychologists or counsellors seeking a fresh approach to working with clients. The Cosmic Egg Timer third edition 2018 is available in colour paperback, 162 pages. Also available on Amazon as ‘textbook style’ ebook, which provides for reading on Kindle Fire, Android, IOS and Windows devices. The Cosmic Egg Timer was first published 2004; second, revised edition 2011 (both b/w paperback). Both issues are now out of print. The Cosmic Egg Timer by Joyce Hopewell and Richard Llewellyn was my first introduction to Astrological Psychology. I absolutely love this book as it welcomes new astrologers, astrologers from other practice, and curious minds into the Huber world of Astrological Psychology. According to Joyce, the intentions were to write in a style that could be absorbed and appreciated by many. This plain-language approach was very welcoming as it allowed an easy, initial, entry point into the powerful Huber teachings. I bought the 2nd edition book about two years ago – through Amazon. I was waiting for my diploma coursework material to arrive and the Cosmic Egg Timer instant download was too appealing to resist (when could I ever resist an astrology book download to my Kindle??). There’s a whole range of books in the Huber method, written by Joyce, published by Hopewell Publishing, in the same informative, fresh, and fun plain-language style of writing. Each of her books present main topics in the Huber style – from Using Age Progression, Aspect Patterns in Colour to The Living Birth Chart, and The Cosmic Egg Timer. Each one of them appeal to the nascent astrologer curiously looking into the astrological psychology. Explaining astrological methods can be challenging. And while I’ve managed to quickly highlight main differences between other forms of astrology and Huber method, I never felt comfortable that I did a proper job in presenting astrological psychology fully. This is where the 3rd edition of Cosmic Egg Timer, paperback edition, really shines. I recently spent a few days explaining a fellow astrologer’s Huber charts to her – working through concepts, etc. I finally realized she had more questions that I could quickly answer so I redirected her to buy a copy (which she did). I’ve had a few situations like this and now with the 3rd edition having even more updated graphics, illustrations, etc. I can easily recommend this highly readable edition. To me, it’s the perfect gateway to astrological psychology. The book more or less follows the APA’s diploma program, in a more easy “heads up” kind of manner. It’s been close to two years since I first read Cosmic Egg Timer and I forgot how much I enjoyed Chapter 2 “Astrological Psychology in Context.” In the course of my studies I’ve spent a lot of time listening to astrology podcasts and reading copious astrology books (astrologers love their books). However, I forgot how succinct and well developed this chapter was written in terms of how astrological psychology was developed and brought into the 21st century. It provides an excellent walkabout that links astrology’s history in the framework of Jung and that of Robert Assagioli’s psychosynthesis within Huber astrology. To understand the power of Huber astrological psychology requires leaving dry land and this chapter, alone, spells out the original manifesto gently. Achieving the illusive “chart synthesis” is challenging for most new astrologers (and seasoned ones, too). Huber Astrological Psychology is built, fundamentally, around seeing the “whole person” within the chart. Chapters 3 and onward walk the reader through a process of uncovering their chart in this holistic manner. A journey, the say, is archetypal in nature – we leave a known area for a lesser known destination of discovery. I would suggest the Cosmic Egg Timer welcomes and takes the reader through this journey in a clever and non threatening manner. The chapters link the reader through a natural chart synthesis method that starts with exploring your chart (chapter 4) through colour, chart images, orientation, etc. I’ve used this book teaching it to a local astrology group and it went over really well – the powerful and straight-forward Huber approach is strengthened through this 3rd edition updated illustrations. Chapter 5 focuses on Aspect Patterns – using the main Ptolemaic aspects and Huber-specific orbs and Bruno Huber’s extensive research into colour theory to explore that deep inner psyche and motivations of the individual. I love seeing the often-mythologized and overly complex aspect patterns written in such an easy-to-read manner with relevant and sane examples. Chapter 6 focuses on planets and how they are described at the three levels and within the scope of astrological psychology. New astrologers will appreciate the clean definitions of the planets while old-hat astrologers will gain understanding on their uses as psychological drives. Chapter 7 takes you into the familiar world of signs by introducing the concept of strength by sign – new concepts that allow us to differentiate inherited strengths. Chapter 8, Houses and the Environment, walks you through the many concepts of Dynamic Energy Curve, Quadrants, Hemispheres, interceptions, etc. The houses are where we meet the world and Huber method places considerable emphasis on them for this reason. Joyce and Richard’s explanations and chart examples are relevant and practical — I found myself dipping back to get their spin on these concepts if I got lost or confused in my studies. Chapter 9 explores the Huber-specific Family Model. It’s a powerful, almost “spooky” (due to how accurate and affirming it can be) subjective view of the family from the child’s perspective. Chapter 10 explores the truly amazing Age Point timing technique. Age Point has captured many non-Huber astrologer’s interest as its profound technique in showcasing psychological events throughout a person’s life is cleanly detailed. In total, Huber uses 3 main charts: Natal, House, and Nodal. Cosmic Egg Timer doesn’t delve into house chart or the nodal chart beyond a quick discussion. This is a good thing, in my opinion, as there is more than enough information and structure provided to allow the reader to achieve a level of understanding about their chart. Further studies and more comprehensive teachings through the new ultimate Astrological Psychology book (the main text for the APA’s diploma program). Chapters 11 and 12 are on “Psychological and Spiritual Growth” and “Bringing it All Together.” Chapter 11 brings the idea of personal and spiritual growth back into alignment as Joyce and Richard harken back to earlier chapters in order to relate the principles and concepts. As Joyce and Richard say, “The whole of this book is about using astrology to facilitate the psychological and spiritual growth of the human being, within the context of the spiritual evolution of humanity.” Chapter 11 begins with a focus on reincarnation and karma; stages of development; levels of consciousness and using the planets at “asleep” “waking” and “awake” levels. I enjoyed how chapter 11 brought the book’s synthesized layout back together to help the reader understand what the process and purposes of astrological psychology are. Chapter 12 is my favourite chapter as we are provided with two complete chart analysis. Some brief chart analysis suggestions are followed with technical and intuitive approaches. Seeing chart synthesis in action is so valuable and I appreciated the common sense approach to chart interpretations they delivered. While I was fond of my e-book 2nd Edition Cosmic Egg Timer, I’m even more proud to showcase my new 3rd edition paperback (with the beautiful cover illustration) on my coffee table. It gets picked up. Questions arise – what’s this? Can you really gain all this from a birth time/place? I’ve found this updated version to be the best conversation starter. It’s a non-intimidating book in many respects. No one picks up my larger Huber books, yet the smaller Cosmic Egg Timer seems to resonate with curious onlookers. I love how much traction I’m getting with is as I fundamentally believe we all need more astrology in our life. Astrological Psychology is such a powerful tool and effective, considerate realizations about a person can be made through the archetypal eye of these symbolic teachings. The Cosmic Egg Timer initiates the first level of curiosity and builds trust with the reader. I felt as though astrology was something I was capable of learning after opening the first few chapters. More studies, and technical books and tutoring can follow, but in my opinion, there’s no better book to begin Huber Astrological Psychology. The theory is enhanced by the use of various examples, with charts in full colour, applying the concepts to real life situations and bringing Astrological Psychology ‘alive’ to the reader. “This is an updated version of the 2011 book… the main difference is this is a colour version and looks so much better for it. As colour is one of the major factor’s in the Huber method of psychological astrology this is a massive plus. The charts and diagrams are much clearer and easier to read, making understanding and synthesis easier. All the major factors of Huber astrology are squeezed wonderfully into this book with many examples on how the method works, with real people in real life. If you are looking for an entry point into Huber astrology then this is the book to start your journey. Please be patient if you are coming from a traditional astrological view point and don’t dismiss the ideas before you have tried them out! As you may be surprised at the depth of psychological insight. This book is a bringing together of all of the Huber’s fundamental teachings into one volume in English, and as such is a very valuable source book for students, and for those who are simply curious. The Introduction outlines the unique approaches of Huber astrology – what they developed that was different to traditional astrology i.e. the use of colour, aspect patterns and their meanings, the Dynamic Energy Curve in the houses, the Family Model, and the Life Clock. 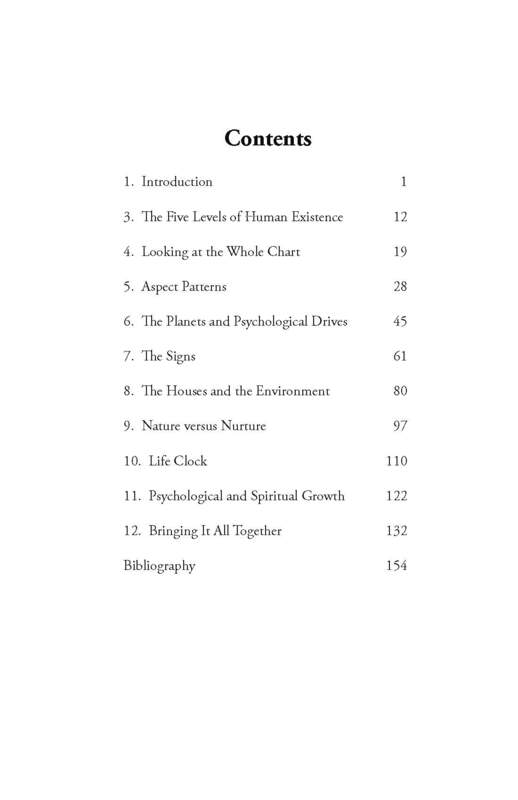 Chapter 2 gives an excellent historical overview, from the earliest known astrology (Sumerians c6000BP), through the Greeks, the Renaissance, 20th.century psychology (Freud, Jung) and the new esoteric spirituality (Blavatsky and Alice Bailey) – these latter two blended in to the psychology of ‘psychosynthesis’ by Assagioli. There is a brief outline of Bruno and Louise’s background with Alice Bailey and Assagioli, and how they blended these teachings with their own astrological research. From here, we are guided systematically through the Five Levels of Human Existence, chapter by chapter. We are offered clear and concise guidelines at each part of the process of unravelling the meaning in the Birth Chart. The chapters are suitably short, so one doesn’t feel daunted or overwhelmed by excessive wordiness. And at the end of each is a useful summary of the contents of that chapter. Chapter 5 gives more detail on the Aspect Pattern approach, and how it was recognized and developed by Bruno Huber, and is therefore totally unique to Huber astrology. There are many useful examples given throughout to illustrate meanings – everyday examples which provide a firm grounding in a way that everyone can relate to – particularly so with the chapters on the Signs and the Family Model. The chapter on the Life Clock provides an excellent analogy of Mountains and Valleys, to describe the Dynamic Energy Curve, which really brings this concept to life. In Chapter 11, Psychological and Spiritual Growth, we have a useful summation of the various ways in which we can see blockages to growth in the chart, whether it is through the aspect structure, or the varying ways planets express themselves at Low Point, Stress Point, Interception and so on. And then of course how we may attempt to resolve and overcome blockages – through the integration of the ego planets, the passage of the Age Point as it aspects the personal and Transpersonal planets, and an understanding of the spiritual significance of the Ascendant and North Node. The final chapter concludes with two valuable examples of chart interpretation. I personally find this book very readable, down-to-earth, and accessible, and would highly recommend it as a general overview of Huber astrological psychology. There is a lovely sense of the spirituality underpinning the Huber approach throughout, so that we are reminded that we are divine potential seeking to bring spirit into matter, and that “ the responsibility lies with each and every one of us to be this spiritual being in the best way we possibly can”. (P181). “This is a really clear and well written introduction to both astrology and to Astrological Psychology. Each chapter is clearly written with a summary at the end. They are an Introduction, in Context, the 5 levels of human existence, looking at the whole chart, aspect patterns, the planets and psychological drives, the signs, the houses and the environment, nature vs nurture, life clock, psychological and spiritual growth, and Bringing it all Together. Book pages are maintained by and copyright the publisher HopeWell. Books are available from retailers, including the APA Bookshop (APA member discount). See also the availability summary.